Guinea pigs love affection, but sharing your affection when you're under the weather could cause your pet to become sick. 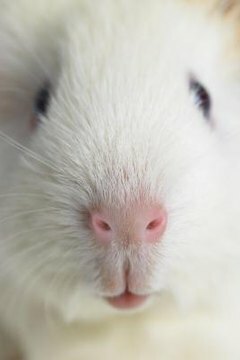 Humans can pass common colds to guinea pigs, and they can prove fatal if not promptly treated. A firm understanding of how illness passes to your guinea pig will allow you to better protect your guinea pig when you have a cold. The two primary diseases you need to worry about passing to your guinea pig are the common cold and the upper respiratory infection. These diseases pass through respiratory droplets, which include the liquid from sneezes and coughs. While humans can get over these diseases fairly easily, guinea pigs require veterinary attention. If left untreated, guinea pigs can die from a common cold or an upper respiratory infection. Colds and upper respiratory infections in guinea pigs will include a variety of symptoms like those humans experience, such as loss of appetite, lethargy, choughing, sneezing, wheezing, nasal discharge and water eyes. Other symptoms are refusal to drink, crusty eyes, a lack of bowel movements, changes in the coat, and receding eyes. If you notice any of these symptoms, an immediate trip to the vet is necessary. The common cold or an upper respiratory infection can turn into pneumonia if left untreated. Never handle a guinea pig if you have a cold. If you're the only one in charge of the guinea pig, wash your hands thoroughly and put on gloves and a mask before cleaning the cage, changing the food and performing other chores. Even after your symptoms have stopped, you may still be contagious. The common cold lasts roughly two weeks and you are most contagious when you have symptoms, but you want to err on the side of caution to prevent your pet from getting sick. You must take your guinea pig to the vet if you notice signs of a cold or upper respiratory infection. Your vet will do a health check, listening for signs of the infection. Once he's sure the guinea pig is sick, he will prescribe antibiotics. Make sure you choose a veterinarian who's skilled in treating small animals. If not, the vet may prescribe a dangerous antibiotic that could kill your pet, such as amoxicillin. Once home, you may need to hand-feed your guinea pig to ensure he is eating properly. If the antibiotics do not seem to be working in the time frame that the vet stated, another trip to the vet's office will be necessary.